Beat eggs, egg whites and parmesan cheese in small bowl together. Season in Salt, Pepper and Garlic Powder. Heat olive oil in a large skillet at medium heat. Sauté mushrooms and bell pepper for about 5mins then remove from heat. Next sauté spinach in skillet with a splash of balsamic vinegar and salt and pepper then remove from pan. In clean pan re-coat with olive oil and once hot pour in eggs. 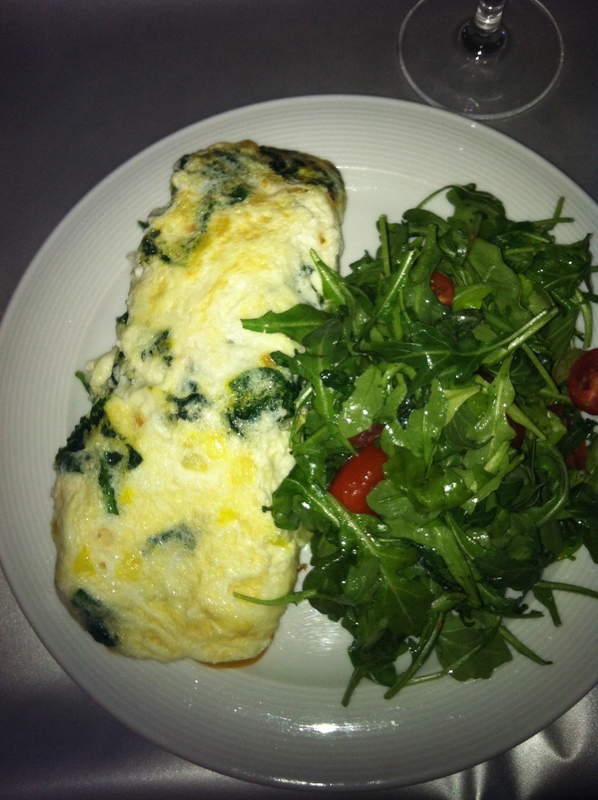 Allow eggs to cook a little then pour in mushrooms, bell pepper and spinach. Mix just a little and let stand. Add Pepper Jack Cheese and as the egg cooks more, start to fold over to make roll do trifold and put on plate. For Salad: mix in bowl, balsamic vinegar, olive oil, salt, pepper, arugula and half cut cherry tomatoes. 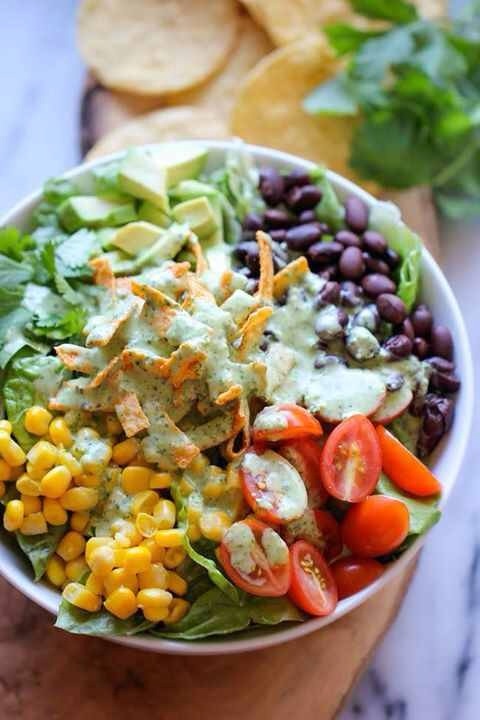 Be sure to coat the salad but don’t drown with homemade dressing. Add to plate with omelet and ENJOY! Chop your kale and clean it. In non-stick skillet heat olive oil and cook down garlic. Once the garlic is cooked soft, turn up heat and add in balsamic vinegar and kale. Toss together. Cover and cook for about 5 minutes. Uncover and cook until all water is evaporated then season with salt and pepper to taste and remove from pan. Mix Sweet Chili Sauce, grated ginger, brown sugar, chili powder and cumin in bowl. Brush rub on salmon. Grill salmon with flesh side down first until charred. (About 4 mins) Flip over and cook for additional 5-6mins. Take out and serve! Take Mahi Mahi and place in dish to squeeze half of lime for juice over it. Then add in cumin, garlic, chili powder, tablespoon of oil and season with salt and pepper. Cover and marinate for about 20mins. While fish is marinating, make your slaw with chopped cabbage, cilantro, onion and lime juice. Be sure to season with salt and pepper and drizzle a little oil on top the set aside. Warm tortillas and wrap in foil then warm dish towel to keep heated. Grill your fish for about 3 minutes on each side. 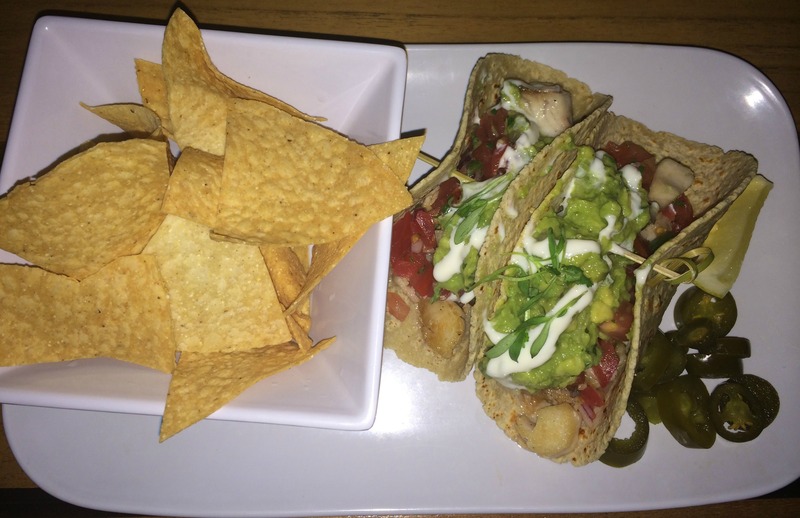 After finish cooking, cut fish in small chunks and construct taco by starting with slaw then fish, then homemade salsa, homemade guacamole, a little sour cream and sprouts for garnish and enjoy! Serve with Tortilla chips, cut jalapeño and half of lime. 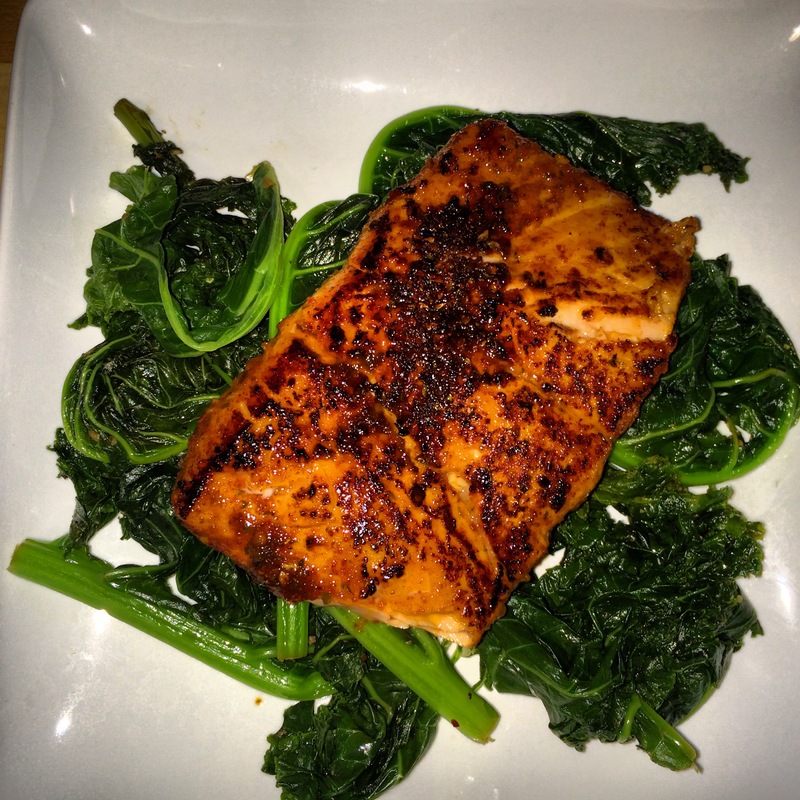 Season salmon with salt, pepper, cumin, crushed red pepper flakes then grill. Flesh side first for about 3mins then flip and grill other side for 4mins and take off heat. Heat large sauté pan with olive oil. Cook down garlic for about 2 minutes then add green pepper, red pepper and onion. After cooked, add splash of red wine vinegar and cooked corn. Remove from heat and add in fresh lime juice to taste, salt and pepper, cumin, chopped cilantro, and crushed red pepper flakes. Cook Kale as same as previous recipe listed above. 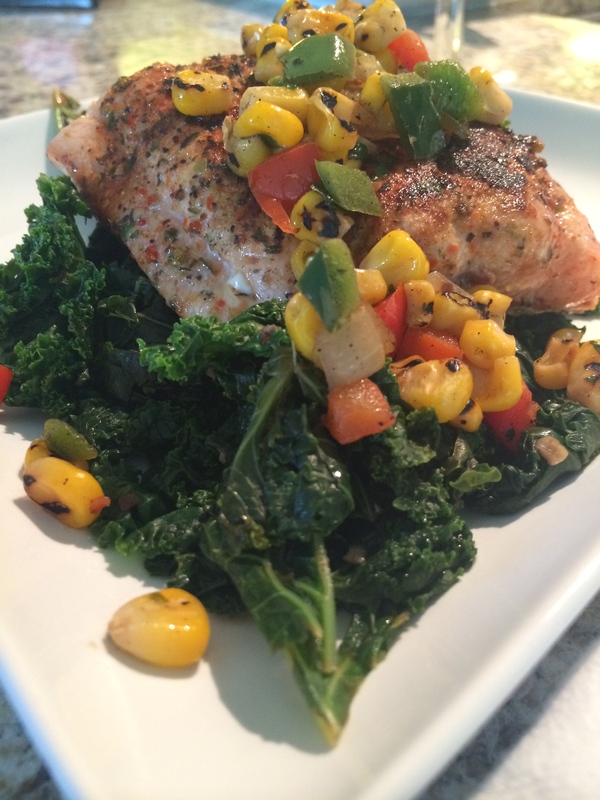 Plate Kale, then salmon and add corn salsa on top and enjoy! 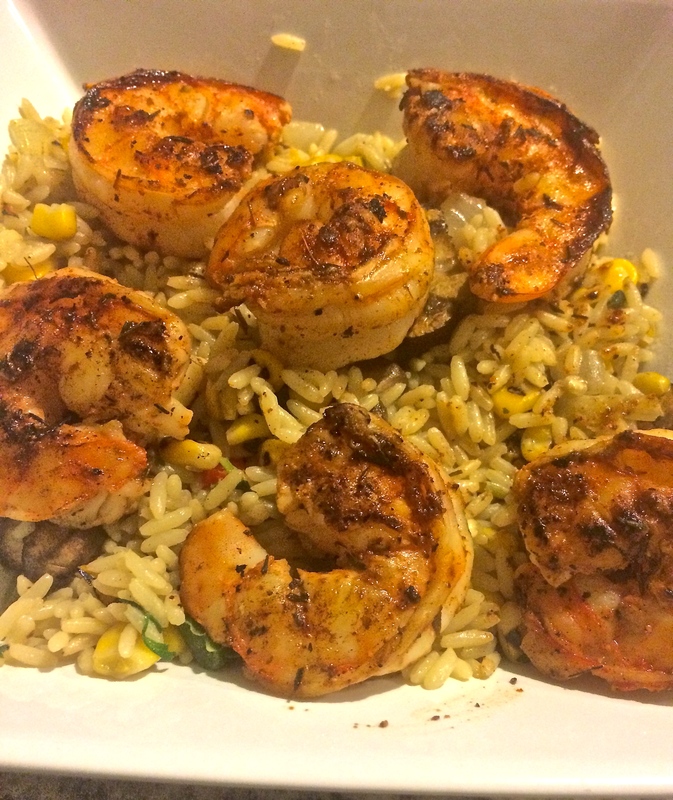 In large skillet cook shrimp about 3mins and season with salt, pepper, and soy sauce. Set aside and cook garlic and onions for about 4-5mins. Stir in all vegetables (corn, carrots, peas) and cook until tender to liking. Stir in cooked basmati rice, green onion, soy sauce and duck sauce. 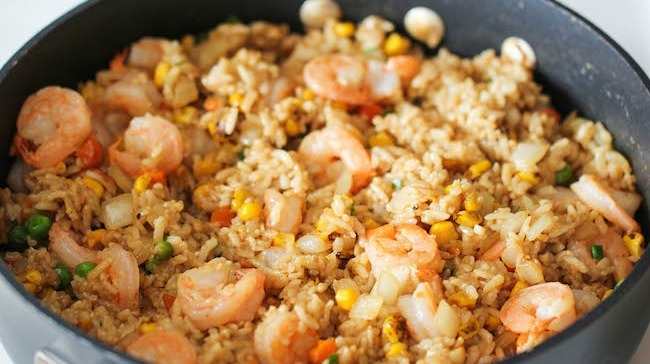 Stir all together and add in shrimp. Enjoy! This is a fave. Quick, easy and fresh salad. Mix together tomatoes, basil, cut cilantro, and mozzarella in a bowl. Mix together fresh lemon juice, oil and vinegar to taste along with salt and pepper. Pour liquid mixture over tomato mixture and refrigerate for up to 1 hour. Take out and add in diced avocado then enjoy. Pan grill asparagus with minced garlic and juice half a lemon while cooking. Season with kosher salt and remove from pan. 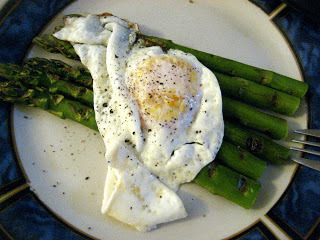 Cook egg over easy, plate on top of asparagus and add pepper. Delish!